A Russian Proton rocket carrying the advanced Express AM4R satellite launches off a pad at Baikonur Cosmodrome, Kazakhstan early Friday (May 16) local time in this still image from a Russia Today news video. The rocket reportedly crashed back to Earth nine minutes after liftoff. A Russian rocket crashed Friday (May 16) while attempting to launch an advanced communications satellite into orbit, according to Russian media reports. The unmanned Russian Proton-M rocket went down nine minutes after blasting off from Baikonur Cosmodrome in Kazakhstan on Friday local time (late Thursday, May 15 Eastern Daylight Time), Russia's Itar-Tass news agency reported. The rocket was carrying the Express-AM4R satellite, a powerful craft designed to provide affordable Internet access to people living in remote parts of Russia. The accident was first reported by Russia Today, Itar-Tass and Ria Novosti. "Contact with the carrier rocket was lost in the 540th second after liftoff," said an official with Russia's federal space agency, known as Roscosmos, according to Itar-Tass. "It is known that the nose cone did not separate from the rocket." There are no reports at this time of any injuries or damage resulting from the crash, according to Russia Today. Future launches of Proton-type vehicles from Baikonur will be grounded until investigators determine the cause of the crash, the outlet added, citing reports by Ria Novosti. Today's crash marks the sixth major failure in the last 3 1/2 years for the Proton, a family of launchers that has been in use since the mid-1960s. The last Proton rocket failure occurred in July 2013, when a Proton-M rocket carrying three satellites for Russia's Glonass navigation system crashed shortly after liftoff. The Proton-M is a 174-foot-tall (53 meters) heavy lifter with three main stages. Many of the rocket's launches also feature a fourth stage, known as the Breeze-M. The Express-AM4R satellite, which weighed 5.8 metric tons and had 63 transponders on board, was billed as Russia's most advanced telecommunications satellite, Russia Today reported. 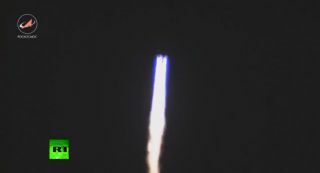 It was to be the third Express series satellite to reach orbit this year; a Proton-M delivered Express AT1 and Express AT2 to space in March.